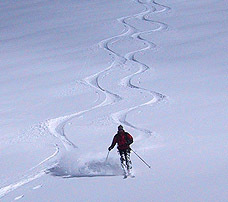 To share any info your have on backcountry skiing in the Interior Mountain, or to get the lowdown from others, check out our backcountry skiing forums on the region. Mountain ranges in the BC Interior enjoy a well-deserved reputation for having some of the best (and most) snow anywhere. Names like the Valhallas, Selkirks, Kootenays and Monashees conjure up images of breathtaking nature, epic days and deep, light powder snow. Storms brewing more than 400km away on the coast are to thank for this. Massive storms in the Pacific collide with the Coastal Mountains and deposit huge dumps of snow. These storms are ploughed east, passing over the dry Interior Plateau and Okanagan Valley ‘til they meet the cooler climate of BC’s Interior. The precip. then unloads on the various interior ranges in the form of dry, light snow. From late October to late March, the snow continues to fall (and accumulate) with temperatures usually hovering just below the freezing mark. No wonder the area is legendary. To get the scoop on avy conditions throughout the interior, check out the CAA forecasts for Kootenay Boundary, South Columbia and North Columbia.